Saturday only - you can sign up and come to the conference for Saturday only. A business who wants to have a booth for display of wares at the fall conference. Your registration fee covers your lunch both days. Nationally known speakers: Jamie Ellis, Michael Palmer, Dwight Wells, Shane Gebaeur. Others include Phyllis Stiles, Kim Bailey and many GBA members in the breakout schedule. 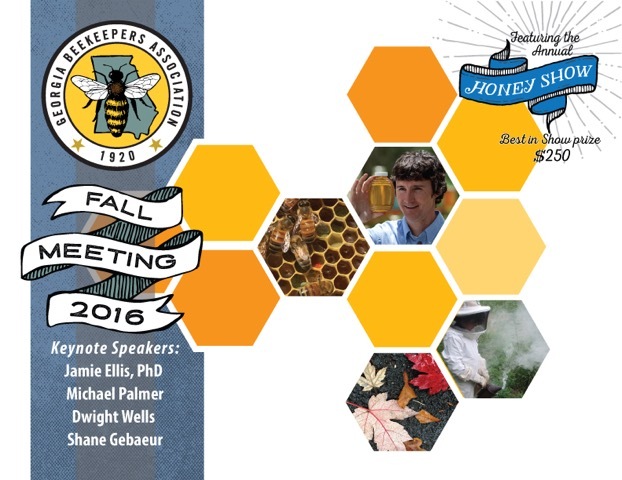 We welcome beekeepers to the GBA fall meeting on October 6, 7, 8, 2016. We have a good lineup of speakers and breakout sessions planned. The conference is open to members and nonmembers of GBA. Registration at the conference includes lunch on both Friday and Saturday and attendance at the social on Friday night. Our speaker list includes several nationally known speakers: Michael Palmer, Dwight Wells, Jamie Ellis, and Shane Gebaeur. Breakout sessions will be presented by Keith Fielder, Bear Kelley, Slade Jarrett, Jennifer Berry, Linda Tillman, Phyllis Stiles, Kim Bailey and others. Registration is $70 for members and $80 for nonmembers. After September 25, registration will be $85 for everyone. We are offering a one day registration fee of $40. After September 25, a one day registration will be $50. NEW HOST HOTEL! This year our speakers and our members will be welcomed at the Fairfield Inn. They are offering us a discount rate of $119 a night for October 6 and 7. The inn rate includes a free breakfast in the mornings and free Wifi in the rooms. Be sure to say you are with the GBA when you call. Make your reservation by calling (478) 452-5202. While the meeting will take place on the campus of Central Georgia Technical College, the reception after the board meeting on Thursday night will be held at the Fairfield Inn. If you are already a member and want to pay your dues for the next year as many of us like to do with the fall meeting registration, visit your member profile page when you have completed your registration and re-up for 2016. If you don't do that at this time, you will be sent a membership renewal reminder at the end of your membership year. Members must have their dues paid up to date to vote by paper ballot in the officer election which is held at the fall meeting. If you are not sure when your dues should be paid, check on your personal profile page. The nonmember rate is $80 per person, and entitles you to get the GBA newsletter as our gift to you for the next year–we hope we will intrigue you enough to want to join our organization. 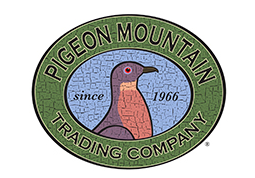 Sponsored by Pigeon Mountain Trading Company.